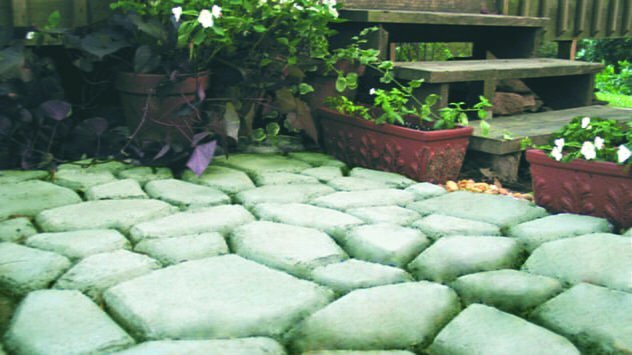 A concrete walkway enhances any home’s backyard. Your home’s details make all the difference. You could have a big backyard with plenty of space for entertaining, but where should your guests walk? A host’s first responsibility is to be hospitable, and that begins with making their home comfortable and inviting. So let’s start with a place where people can place their feet! You may think that building a concrete walkway, especially one with an intricate design, is challenging and time-consuming. Well, it would be without one handy tool: the Quikrete WalkMaker! This line of reusable, 2-foot-by-2-foot plastic forms includes four attractive patterns: Country Stone, European Block, Running Bond Brick and Basket Weave. Installing a walkway couldn’t be easier thanks to these forms. Just purchase the pattern that fits your style, find a good spot for the walkway, prep the site, mix the concrete and fill in the forms.